In today’s society, the security system is a lot less expensive and more flexible in terms of usage than what they used to be a decade ago. Cameras are available that can operate solely as a self-contained unit, which means the equipment has everything you need to capture, record and view video. Depending on the system you choose, some of the units will allow your images to be sent over the Internet and viewed from a remote location. Security systems are also available that allow you to connect more than one camera and then link them together with a computer or other recording device. Regardless of whether you have a business or a home, a security camera plays a pivotal role in enhancing your security level and giving you the peace of mind your employees and family desire. Cameras today are much more sophisticated and advanced. They can be used in any number of different settings throughout modern society, including that of a college campus, schools, traffic lights, school buses and even places where people go to worship. Businesses and homes remain two of the top locations for a security camera to be placed. A home security camera is easy to work with and simple to set up. They will help deliver an added layer of protection for any type of home, including an apartment, condominium, duplex and single-family residence. In terms of advanced technology, your security system can be installed along and exterior or interior wall in a relatively short period. Many parents implement a security camera to watch over the nanny and their kids when they are away from the home. They will also be able to monitor any traffic coming to and from their home, as well as check the outside perimeter to ensure no one is lurking around unexpectedly. Countless businesses will end up installing a security system as a way to deter theft, shoplifting and various other crimes. For some businesses, the only thing they need is a basic system. An inexpensive black and white security system may be just the thing that many business owners need. If you have an issue with shoplifting, you can help rectify the problem with a large bullet camera in plain sight for any intruder to see. Tinted dome cameras work great as well. When you have a tinted camera, there is no way for those entering in to determine which way the camera is facing. Cameras are able to monitor your cash register and other blind spot outside of the doors. Security cameras come in a wired or wireless version. Wireless systems are susceptible to interference from any additional wireless items you may have around your property. Image quality is less superior on a wireless camera than it is on one that is wired. If you choose to go with a wired setup, you won’t have to worry about the interference from outside devices, images are exceptionally clear, images will be better overall, cables appear in numerous locations and you will generally have to spend more money upfront on the unit. Large security cameras that are easily visible and tiny security cameras that can be easily hidden are both great means for conducting surveillance. Smaller cameras can be hidden inside of an alarm clock, picture frame or planter. If you have a wide-angle camera, you can use them to view a large area like your loading docks or backyard. You may determine that a PTZ camera will work best for your property. This type of camera allows you to look at an image up close. DVRs, VCRs and computers are perfect for recording your footage for later viewing. Begin your surveillance by measuring the area in which you need to cover. Determine the entryways, exits and windows that will need to be monitored with a security camera. Ask yourself some of the following questions to help determine what it is that you need. • Are you searching to monitor something, someone or a specific area? An example would be the cash register, children playing in the backyard or your garage. • Will you need a monitoring service? Monitoring services work to keep a continual watch over your property so you don’t have to worry about anything. • Is a motion sensor going to work the best for your area? Depending on where you are going to position the camera, a motion sensor may be necessary to trigger the recording process. • Do you need your footage recorded or live? For many people, recorded footage may work fine, but for others, it needs to be viewed live to catch the perpetrator in the act. You will need to account for your budget to form a priority list of what is going to be the most important for your particular needs. It may be necessary to delay getting all of the motion detectors and cameras that you desire. Regardless of what type of camera you have, the main thing to take into account is that the system is working properly. When you have a system that is not working correctly, it will not do you any good at catching a criminal. You need to ensure your system is up to par and operating correctly. If you have a component that ceases to work, you will need to enlist a fast repair on your system to make sure you are not vulnerable to an attack. Getting a speedy repair on your security camera means you will not have to worry about missing footage that could mean the difference between catching a burglar and losing out on your belongings and money. Don’t delay in getting your cameras properly repaired. 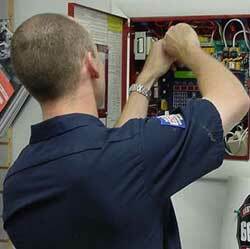 Take the time to ensure they are properly working by enlisting the help of a professional repair technician today. Contact us today.